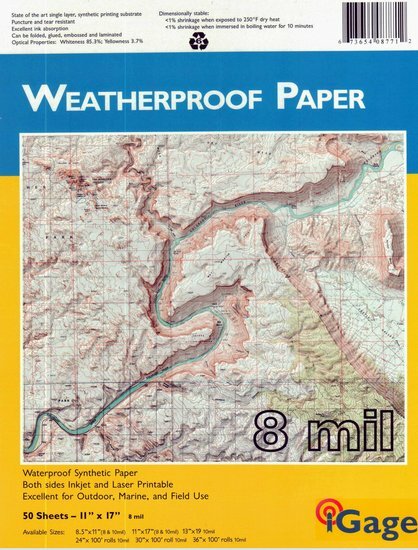 iGage All-Weather Paper Laser/Inkjet 11 x 17 50 sheets 8 MIL  - $49.95 : Trail Explorers Outpost, Keeping the Adventure Alive! 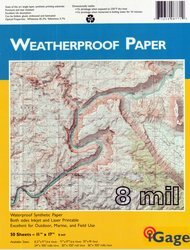 Weatherproof Paper is excellent for extreme outdoor, marine and field use. It is even possible to write on Weatherproof Paper underwater with a standard ink pen ( gas charged write-anywhere pens do best underwater.) It is not possible to write on this Weatherproof Paper with a pencil. Annotate with ink, felt tip or highlighter pens. See my other items for additional Sizes.